With prospects being inundated with more content than ever, a complete and accurate content strategy is essential in order to reach the right customers on the right channels, at the right time. This is a challenge for small business owners, who are frequently responsible for all aspects of their organization, and lack sufficient time to determine their own marketing needs. 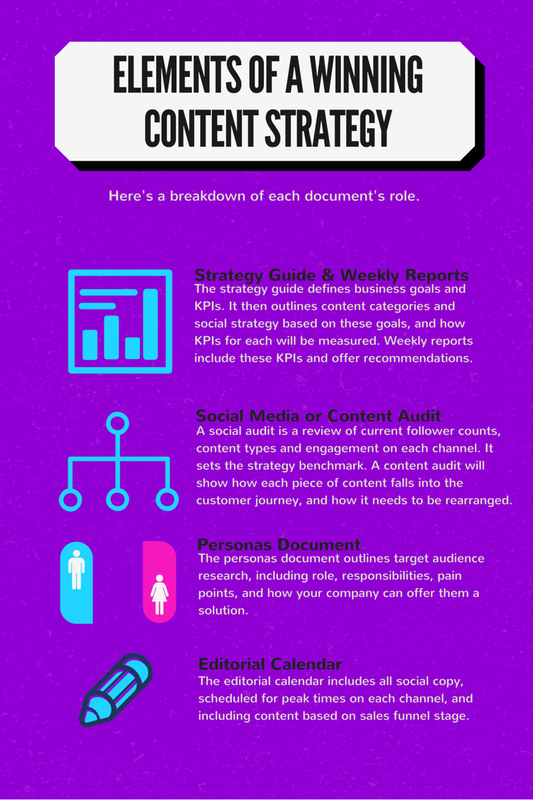 To help simplify the concept of content marketing, here is a helpful checklist of documents you’ll see in a typical strategy, and how they contribute to your overall goal. First, a holistic document is created that defines the goals that your business wants to focus on within the strategy, and identifies key performance indicators (KPIs) needed to measure progress towards each of those goals. Examples of KPIs include post-level views and engagements, content views and click-throughs, and link click-throughs. KPIs can also include existing actions and goals you have within your Google Analytics. For example, your strategy could focus on driving to your website, and then using social and Google Analytics to track how each post and piece of content contributes to page visits. Subsequent reports (typically weekly) focus on a strategy’s defined goals and KPIs from this document, how each goal is being met in terms of the KPIs, and what strategy changes are needed. 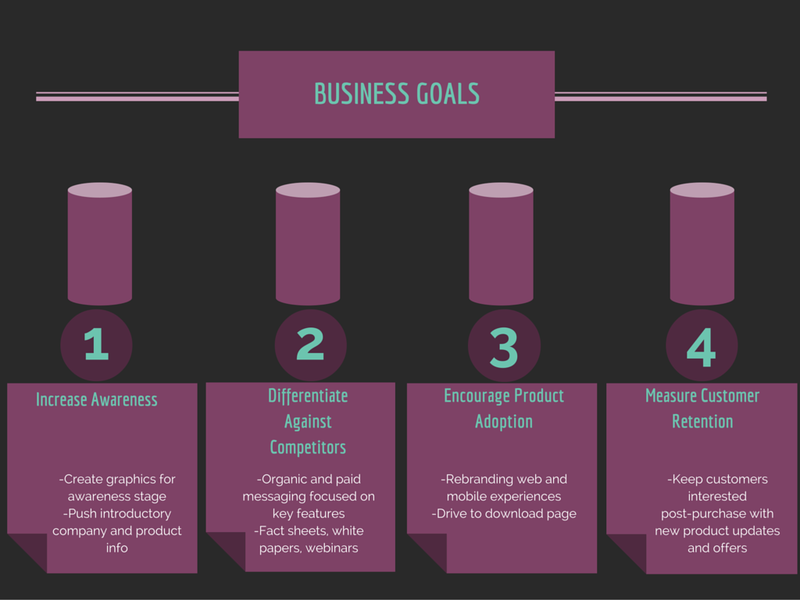 An example of business goals within a strategy document. Here, we’re specifying messaging and content suggestions for each goal. Drilling down into how your strategy will be successful, let’s look at which documents contribute at which level. Right customers- Your strategy needs a personas document before anything, to define audiences and continually update as new data emerges on them. Who are you trying to reach? What is their role within their organization? What are their current challenges, and how can your business solve them? 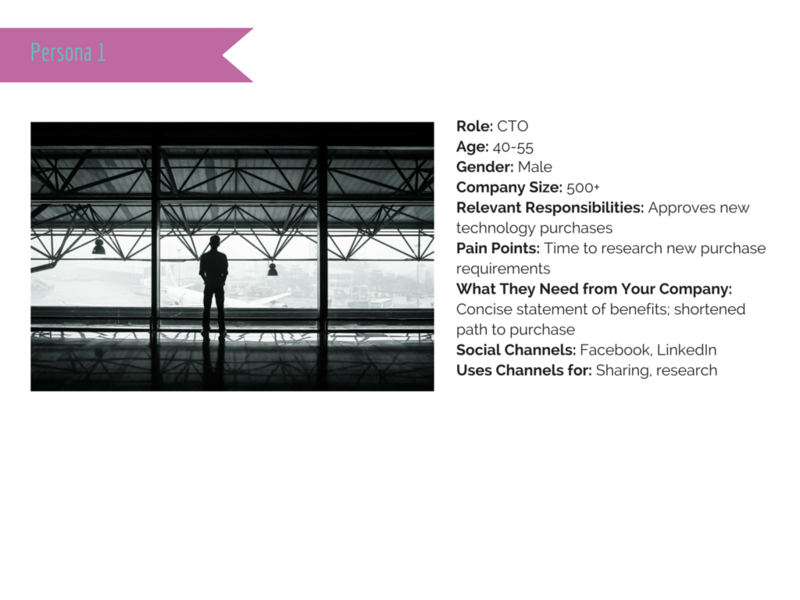 An example of a CTO persona, a target demographic for an IT supplier. Right channels- Where does your audience search for information on your product or service? Some of this will be provided in the personas document; sentiment analysis using an analytics tool can also help, to see if user attitudes towards your industry and/or business on a particular channel are positive or negative. Right time- This is where it’s crucial to separate out users by stage of the sales funnel. Do users on a particular channel exhibit different behavior, and therefore occupy a different stage? Once we know this, we can create the editorial calendar and customize copy and content by channel. Finally, posts need to be scheduled at times proven to be optimal on those channels- are audiences more likely to check their feeds in the morning, afternoon, or evening? Keep in mind time differences for global audiences. Content marketing is a holistic process–each step is interdependent. It’s a lot to consider, and can be tough to grasp completely without a marketing background. Even if one step is missed, it could mean lost sales for your business. For your convenience, here is a breakdown of all the documents in an easy-to-reference infographic. The point of having a cohesive strategy and all its corresponding documents is to have your goals achieved–tough to do when you have so many other things to worry about. However, someone who knows what they’re doing can create and track your strategy for you, saving you the time from having to figure it out yourself. ContentCandy offers ALL of the services listed in this post–creating your strategy from the ground up, and executing and measuring for real results. A consultative process, you’ll be there each step of the way so you always know what’s going on, and how each piece of the strategy translates into progress toward your defined goals. Don’t let pieces of the puzzle go missing, and your potential customers drop off without purchasing–schedule a free 30-minute consult today to start mapping your strategy to success! All content designed by ContentCandy.